We are living in society in which anti-flesh puritanism has occupied our bodies and minds for centuries. With multitudes of sensory stimuli circulating around us in the 21st Century, equally extreme visual and physical stimuli may be necessary to renew our body consciousness and awareness of the flesh. This is where my work comes in. Inspired by the necessity for body awareness, my work is informed by biological processes, sexually subversive aesthetics and a disassociation from puritan notions of bodily shame. My current body of work consists of jewelry that objectifies our internal or shameful bodily processes, making them external and impossible to ignore. The artworks confront the wearer with their own bodies, toying with discomfort, while appealing to the senses in such a way that the pieces intrigue as much as they repel.. The Heart Beats- 3”x12”x2”-2011- copper, sterling silver, plexi glass, USB recording module, bass string, poly tubing, liver of sulfur; die-formed, fabricated, bolted. 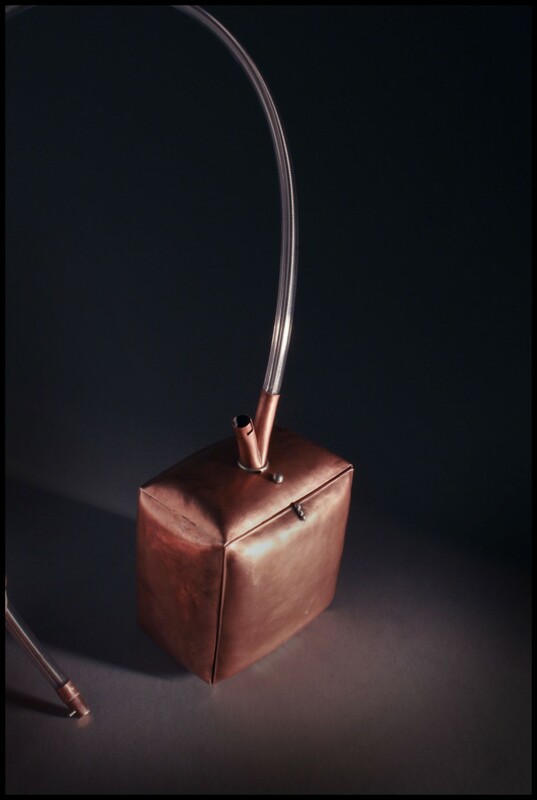 This piece rests near the wearer’s heart as an external reminder of internal processes, correlating in size, (280 cubic cm) shape, and sound. When the silver button behind the neck cord is pushed it activates a USB audio module, which is housed inside the box, and a soft beating heart sound emanates from within. 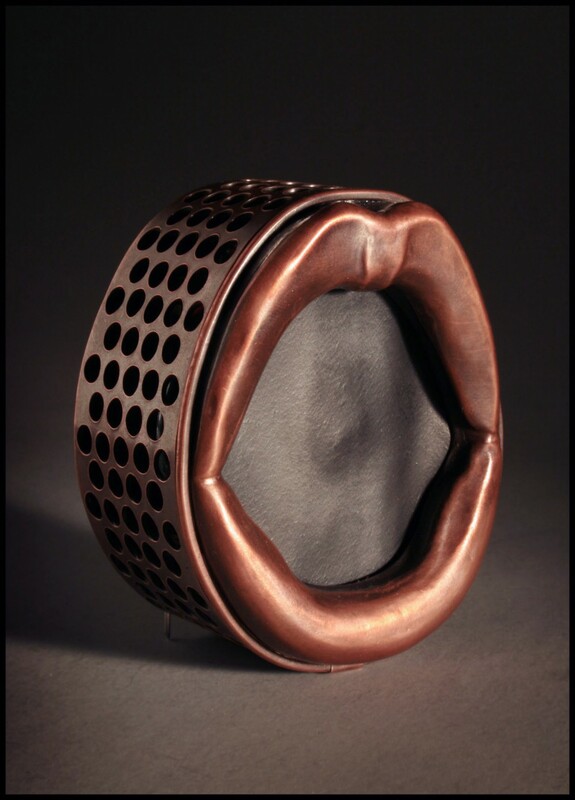 “0” Face-Broach-2”x3”x2”-2011- copper, USB recording module, rubber, stainless steel, liver of sulfur; chased, fabricated, etched. When the rubber between the lips is pushed in, your fingertips make contact with a button that activates the USB module. A looped audio track of a woman breathing heavily and moaning slightly plays until the button is pushed again. Unguent Collar-2011-Sterling silver, disposable pipettes, coconut oil, oil-based food coloring, rubber o-rings, bass string. Coconut oil solidifies at or below room temperature. When the collar is worn, the heat from the body liquefies the oil and it slowly bleeds down the torso. The oil and food coloring mixture starts out very opaque, and becomes more translucent as it thins and is absorbed through the skin. The total transformation can take anywhere from 30 to 60 minutes depending on the temperature of the wearer’s skin and the environment they are in.